Mini Charts for Excel (Dashboard Tools) help you understand complex relationships in data with sparklines. Sparklines are tiny graphics placed in an Excel cell to dramatically improve data visualization for fast, effective parallel comparisons. 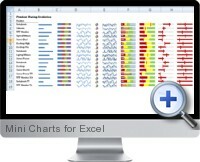 Mini Charts for Excel are integrated with Excel personalization options. Because they are created based on Excel native graphics, they can be personalized using all the styles and formats that Excel offers to enrich its presentation. Given that Mini Charts for Excel are based on native Excel functionality it is not necessary to install fonts or any additional components to be able to visualize the graphics and distribute them. In Excel to format a cell we must choose a format when the "True" condition is met and another when it is not. In comparison, Mini Charts for Excel uses only one condition, without the need to configure its opposite. Mini Charts can be generated from an external data sheet. This sheet can be in the same workbook, in another book, in a database or in a web page. Mini Charts for Excel allows categorizing databases in Excel or large pieces of data using dynamic tables. Mini Chart types include sparklines, heat maps, icons, bump charts (with real time data update) and other charts. Export updated chart images directly to other Microsoft Office applications such as Word and PowerPoint. Provides useful tools for dashboard reporting in Excel including cell reference tracking, auditing, navigation, links, version and name management.